J & R Cleaning Services was founded in the early 1990's and has been serving Goshen and the surrounding communities for over 19 years. Based in Goshen our company is centrally located to serve your cleaning needs. 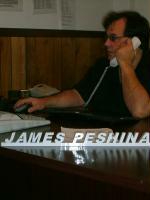 Owner James Peshina and his staff, are highly dedicated to serving our customers in a professional and friendly manner, working hard to keep up with the current cleaning tools and skills to assure that your job will be completed to the highest standards.